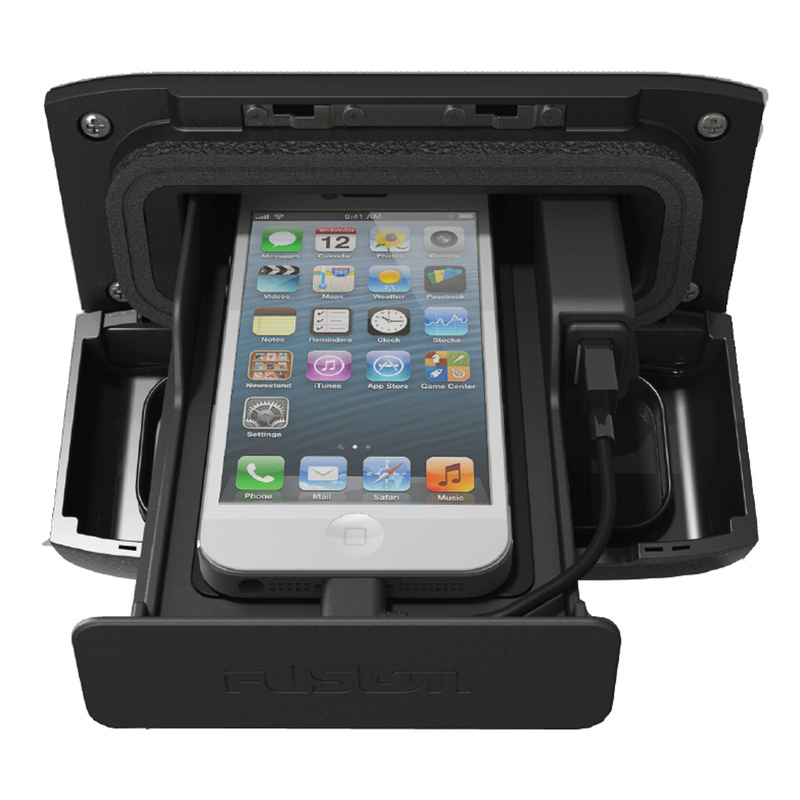 Designed to offer water resistant security to your smartphone in a marine environment. Engineered to cater from the smallest to some of the largest smartphones/media players on the market. Included are 3 adaptor cables which support Apple 30 Pin iPhones and iPods, the new generation iPhones and iPods with the Lightning connectors, as well as Android devices with Micro-USB connectors. When bulkhead mounted the UNI-Dock complies with IPx5 water resistant standards, making it the perfect charging station for your precious smartphone/media player. The UNI-Dock features a 8.2' connection cable which allows for convenient installation away from the FUSION Marine Stereo if necessary. The MS-UNIDOCK also features an improved stainless steel locking mechanism which is easier to use and stronger than previous docking solutions to keep your smartphone/media player safer for longer. In order to experience the advanced functionality of Android integration into your FUSION 700 or 205 series a software upgrade is required (available from www.fusionelectronics.com). FUSION's new software enables seamless integration of the Android music interface onto the FUSION marine stereo platform. The maximum supported smartphone size that can be inserted into the UNI-Dock is 5.39 x 2.80 x 0.51 in including the adapter cable, the UNI-Dock will even charge and house the Samsung Galaxy S3 and S4 securely with ease. Compatible with the following FUSION Marine Stereos: MS-AV700, MS-AV700i, MS-RA205, MS-IP700i, MS-AV650, MS-AV750.